I just love when I see Apologia on the list of upcoming reviews. They never fail to amaze me, and Mr. B does so well with their offerings. For the last few weeks, we have been blessed to be reviewing Exploring Creation with Human Anatomy and Physiology. I set out to follow the included suggested schedule. The Notebooking Journal has a 2 day a week schedule lined out for easy planning, but I found this was a bit too much for Mr. B so we split it up. We would just work on an activity each day, 3 days a week. Sometimes we would have to work on the same activity over the course of a couple of days. He did very well with the reading part. He needs to work on a few different reading mechanics, so I used this to help with those issues as well. Sometimes we would read aloud, alternating sections. I would read, then he would, then back to me, etc. Often times, I would pop in the MP3 CD and he would follow along in the book while the audio book read the words. This is GREAT for spectrum kids because they are getting both visual and auditory input. Mr. B works faster when we works with the MP3 going as he follows along. He will do an entire chapter in one day! Today, for example, he was so engrossed in listening and following along that he asked to listen to an additional chapter. I like how there are Bible verses integrated into the text, but everything is very science'y still. Have you ever encountered a religious based "science" curriculum that's more like an additional Bible study? That's not this. There are Bible verses included, such as one about the tongue, but it's not a substitute for any sort of Bible study. I also love how everything is explained in real world ways, like the epiglottis and tongue, and how God gave us the reflex to cough when choked. Overall, Mr. B has been enjoying all of the notebooking activities. He especially likes the crossword puzzles and the mini books. The Crossword puzzles are not super easy! They take some brain power to complete. The activities are great reinforcement for the textual lessons. Overall, we both really like this a lot. I'm very impressed by how much Mr. B loves it. He is truly learning and retaining what he has learned! It's fantastic! I was more than shocked by how well he took to the MP3 CD. We have Apologia General Science, too, that I had planned to start next year. We do not have a disc for that one, and I plan to buy it before we start it! It has been THAT great for him! I'm amazed! The included activities are fun, easy to do, and really further the learning. Mr. B can even do some of them on his own, with little to no assistance from me. This is pretty centered around a Charlotte Mason approach, especially with the included narration breaks, but it's not so much so that you wouldn't benefit from it if you subscribe to a different type of method. I HIGHLY recommend this program! Does Apologia Exploring Creation with Human Anatomy and Physiology Pass My 4 Ingredient Test? Does Apologia Educational Ministries Pass My 4 Ingredient Test? This is a physical product. There is an included schedule in the student workbook, but you can easily adapt that. It's set up for a 2 days a week format, with 2 activities each day. But you could easily change that up to fit your schedule and needs. We found that was a bit too intense in a single sitting at times, so we split it into 4 days. This will cover multiple grades. Mr B is currently doing 6th and 7th grade work, and this was perfect for him using the regular Notebooking Journal. 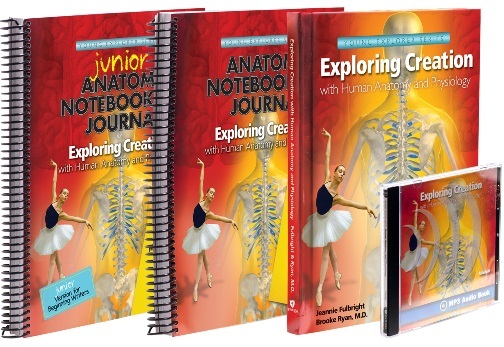 Younger students would use the Junior Notebooking Journal-though Mr. B likes that one, too. There are no hidden fees, but you may want to plan ahead for the "Try This" experiment activities. The book does mention a science kit, but there isn't one available on the site. The items are pretty easy to find though-like Nerds candies, and the like. Mr. B found it to be engaging and exciting. There are a lot of colorful pictures, but its not overwhelming or distracting. The MP3CD is a must for us. He does soooo much better when he can hear the book being read to him, and follow along at the same time. You can split the lessons up so that they aren't too long. Please check out the rest of the Homeschool Review Crew to see what others have to say!